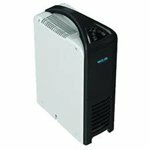 The Eco Air ECO10LDN Dehumidifier shares the slim profile of the ECO8LDN but has 25% more capacity to deal with larger areas of the home. A Hepa air filter reduces the number of unwelcome particles in the air and its low level of noise will be welcomed by users. Similar in almost all respects to the ECO8LDN the Eco Air ECO10LDN differs in having a greater water extraction capacity of 10 litres per day. This enables it to dehumidify an area of up to 17m2 or 180 sq ft (manufacturer's recommendation). This makes it effective in slightly larger areas or will enable it to achieve similar results to the ECO8LDN while operating for less hours in the day, saving energy. Once again it is suitable for small homes or for use in an individual room within a larger home. One advantage of the Eco Air ECO10LDN is its adjustable humidistat. This device senses the level of relative humidity present in a room and switches the machine on only when the level falls below that programmed into the humidistat. The level of relative humidity is thereby maintained constantly, within a few percentage points, which is more comfortable for occupants of the home and saves energy by restricting the operating time of the unit to the minimum necessary. Most people will find a level of relative humidity of between 30% and 70% tolerable but to protect a home and its contents against moisture damage and mould growth, and to deter dust mites, a level of 45 to 50% is required. A stable level of relative humidity also helps to preserve sensitive items found in some homes, such as a piano. The Eco Air ECO10LDN contains a removable water collection container into which the water removed from the air is collected. This container has a capacity of 1.5 litres and the water level is visible so that it can be emptied as required. Once it is full the machine switches off, to prevent spillage, but this obviously prevents the unit from doing its job. If the task of emptying the container is one you are inclined to overlook, or it is simply too tedious, the Eco Air ECO10LDN is equipped for continuous drainage to relieve you of this chore. A small plastic hose can be inserted into a discharge port and run to a convenient drain or other outlet. The water feed depends on gravity so the drain must be on the same level as the dehumidifier. It may be helpful to raise the unit a foot or two from the floor to improve the flow, which should not be too difficult with a dehumidifier so compact and relatively light as this. One problem with refrigerative dehumidifiers is the formation of ice on the refrigeration coils. These coils are like those in a refrigerator and ice can form on them at room temperatures as high as 18°C. Once ice forms a dehumidifier has to suspend operation until the ice melts and this may mean that it is out of action for considerable periods through the day. The ECO10LDN incorporates an auto-defrost feature which quickly clears the ice and allows the unit to continue operating normally. With this device the ECO10LDN can operate effectively at temperatures as low as 5°C. If the heating in a home is not running when the house is empty, or at night, this feature ensures that the dehumidifier will continue to keep the moisture level under control regardless. The Eco Air ECO10LDN shares the other advantages of the ECO8LDN and is the same compact size and light weight to suit it for use where space is limited and to make it easily portable using the carrying handle. It is no noisier, at 43dB, than its companion model and, although not silent, this is quiet for a dehumidifier. This unit is no energy hog either, with a draw of only 230 watts, and comes with electronic controls for ease of use and a Hepa air filter for improved air quality.